CRAIG Gardner has followed Carlos Cuellar and Andreas Dossena out of the exit door at Sunderland, the Echo can reveal. The former Birmingham City and Aston Villa midfielder has said his farewells to friends in the region and moved out of his house in the North East and accepts his three-year stay at the club is over. But Seb Larsson could well have a future on Wearside with the Swede still involved in talks which are expected to reach their conclusion this weekend. Both Gardner and Larsson joined from Birmingham City after the Blues’ relegation in 2011, arriving within a week of each other - Gardner for a £6m fee, Larsson on a free. The pair were part of former Sunderland boss Steve Bruce’s last transfer window in charge which, just like the one last summer, saw a raft of new signings arrive but fail to gel quickly enough to save their manager’s job. The decision not to extend Gardner’s stay at the Stadium of Light comes as no surprise to the player himself, who loved being at the club but realised the writing was on the wall when starts in games dried up. He made 77 appearances for Sunderland, scoring 14 goals, during his time at the club. This season he was involved in 26 games, scoring three goals, but was increasingly used as a substitute. He started just two games in 2014, both of them cup clashes, scoring in one of them - a trademark volley from range in the 1-0 win over Southampton in the FA Cup. Gardner will now take his summer break before contemplating his next move. But there is likely to be no shortage of clubs ready to offer him a fresh start with West Brom, credited with a long-standing interest in the Brummie, expected to lead the way. Larrsson’s fate, meanwhile, has yet to be decided. 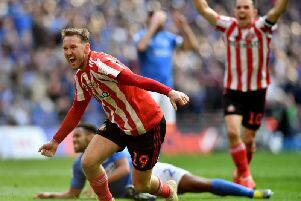 Sunderland are interested in brokering a new deal for a player who shone in Sunderland’s Premier League survival mission, even though his clear preference is to play on the wing, rather than in the midfield engine room he has occupied this season. Clubs both at home and abroad are monitoring the Swedish international’s situation closely, but Sunderland have opened discussions and hope they will conclude successfully. The other players who are out of contract at Sunderland are Phil Bardsley, Keiren Westwood and Jack Colback.